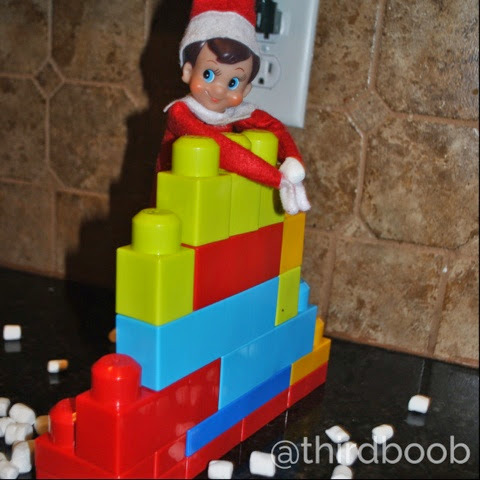 if you have missed them, we have elf on the shelf ideas covered for you. here are our previous ideas from weeks past. 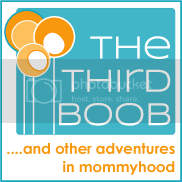 we are hitting the elf home stretch and we are saving some of our favorites for last. 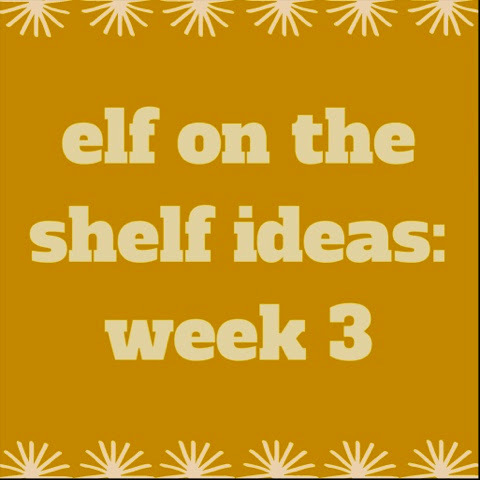 here is another week of elf on the shelf ideas. if you are anything like me, i'm ready for our elf to fly home until next year. still, my kids are so stinking excited about him that i press on. i'm not sure if one day they will thank me or if i am ruining them for their future spouses. regardless, here i go with week three. this one takes a few minutes to prepare. i'm not going to lie. still, about this time in december my kids need a reminder to actually behave. i may or may not have already threatened to return all of their christmas presents if they cannot be nice to one another. 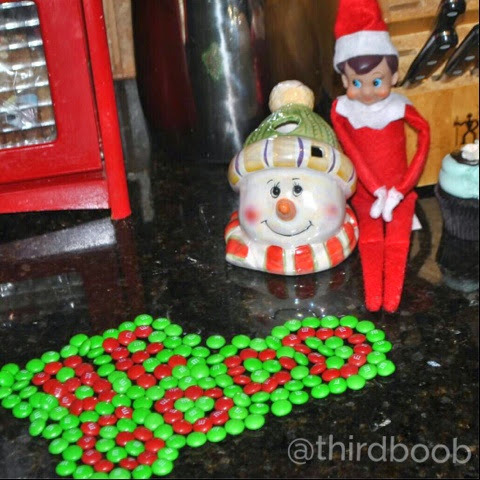 elf has my back this night. this one goes hand in hand with the one above. 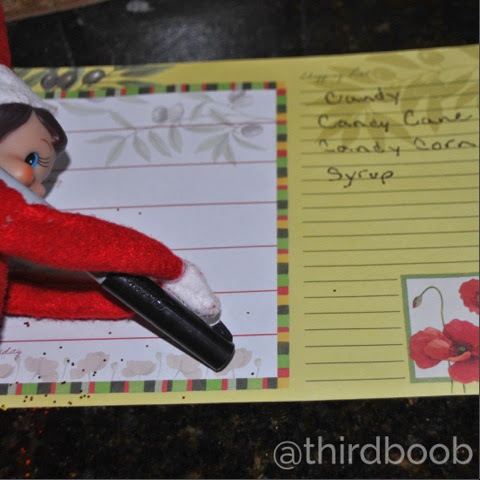 sometimes the kids need a note from their elf to get the "behave" message into their brains. i reserve this one for particularly rough days. it usually does the trick. this is one of my favorites. 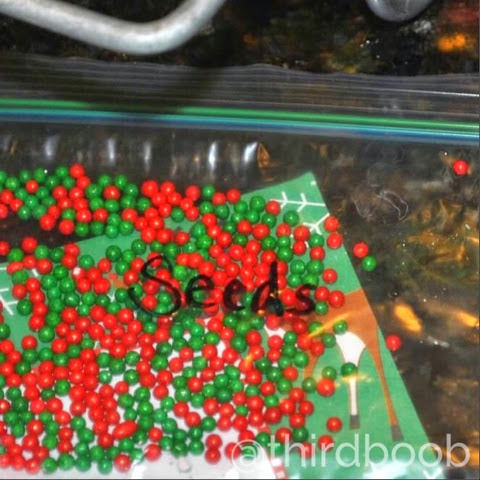 i purchase some little decorative candy balls (in the sprinkle section of your stores) and put them in a bag labeled "seeds." 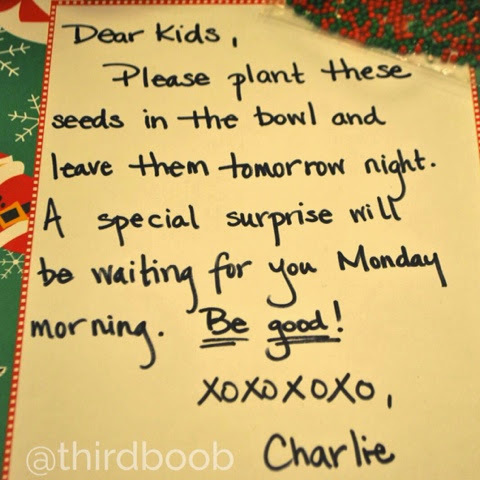 the kids are given instruction to plant the "seeds" into a bowl full of sugar and see what happens over the next night. i get that these cookies are probably not the best thing for my kids, but at christmastime, i live by the "everything in moderation" motto. these cookies are ready to go in the refrigerator section of your grocery store. i have seen some people put sticks into them to make them stand up but i like just placing them in the sugar. it looks more like they sprouted up overnight. 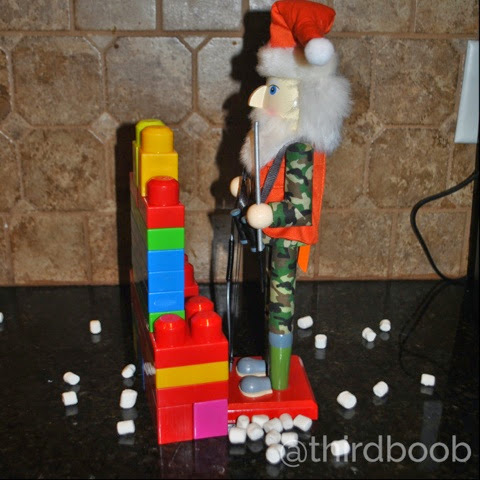 the kids are always amazed at our elf's abilities. this one really doesn't take long to set up and it is super cute when you get all the pieces together. 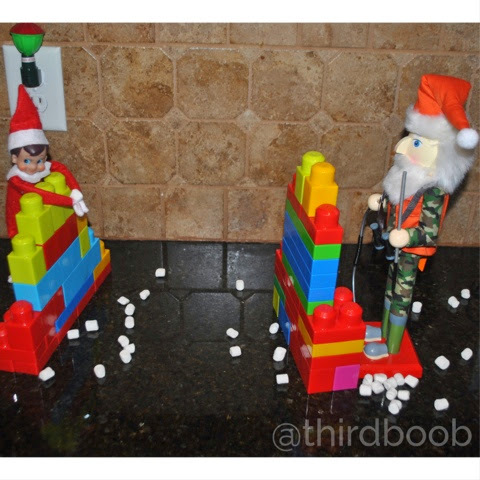 your elf just needs a snowball fight opponent and some marshmallow "snowballs" to make it look cute. legos are the perfect barricades to protect the two fighters from the incoming blasts. every year we make a big batch of all kinds of different christmas treats for our neighbors. 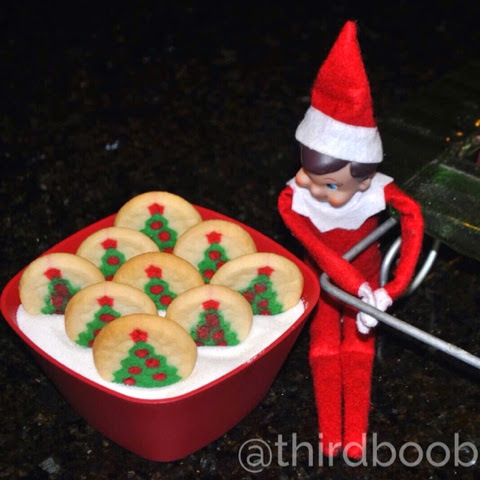 each year the elf gets the baking day started by making our first batch. the kids get excited when they see this one because they know what is coming. one of my favorite movies of all time is "elf." 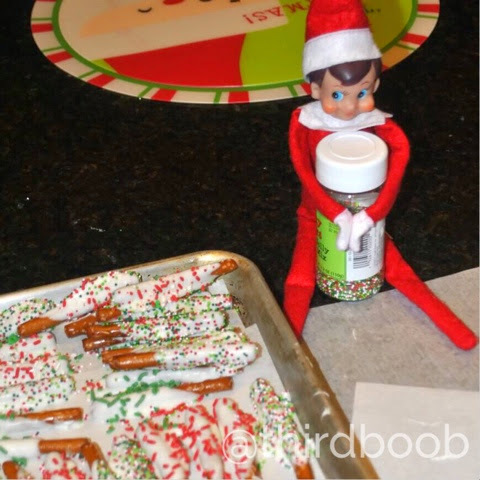 if you remember the four major food groups for elves are candy, candy canes, candy corn and syrup. what better to add to the grocery list than the diet essentials? that's it! week three...done. you are on the home stretch, my friend. you've got this.